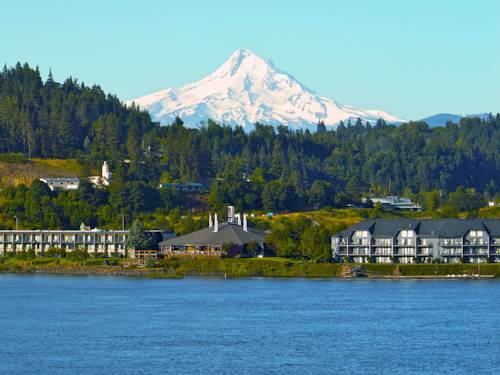 Join us at the only award-winning Hood River hotel nestled on the scenic Columbia River shoreline. A vast array of room types are offered to suit a variety of budgets, from non-view value rooms to deluxe river view suites. Complimentary cooked to order breakfast (for qualifying room rates) served in Riverside - our on-site restaurant offering river views from every table. Lunch and dinner also available with menus that change seasonally, as well as a Wine Spectator Award-winning wine list. Inviting, outdoor deck dining available seasonally. Cebu Lounge features flat screen TV sports and the best happy hours in town. Visit our inviting heated outdoor pool and spa - open year-round. Our modern indoor fitness facility features an indoor spa and sauna. Strong Wi-Fi signals available throughout our property to keep you in touch with the outside world. Our flexible meeting space can accommodate small meetings or large events. Contact our professional meeting planners and catering staff to help develop your perfect conference, wedding function, or retreat. There's so much to do - or choose to do nothing but relax. We hope to see you soon! �From: I-84 East. Take Exit 64 from Interstate 84. Turn left under the freeway, staying in the far right lane. Go through that intersection and at the second light, turn right. The Best Western Plus Hood River Inn is located just past the Starbucks and McDonalds�. �From: I-84 West. Take Exit 64 from Interstate 84. Turn right. At the next light, turn right again. The Best Western Plus Hood River Inn is located at the just past the Starbucks and McDonalds�. �From: Hwy 35 North. Take Hwy 35 North to Hood River. Go straight onto Button Bridge Road. Go to the first stop light, proceed under the freeway and through the intersection and at the second light, turn right. The Best Western Plus Hood River Inn is located just past the Starbucks and McDonalds�. �From: Washington via Bridge Cross in to Oregon from Washington, paying the bridge toll. Turn left at the intersection. The Best Western Plus Hood River Inn is located just past the Starbucks and McDonalds�. Windsurfing - 0.01 mile(s) from Hood River Waterplay, Seasonal windsurfing & kiteboarding lessons. Beachcomber bike rentals free for hotel guests. 2.50 mile(s) from BNSF Railway Co.
Twenty feet tall, and it smells delicious. The Chocolate Cascade has been gushing goodness since 1992. ~49 miles from Hood River. ~51 miles from Hood River.